Order within 33 hours and 37 minutes to receive your order by Tuesday 23rd April. This stunningly classic brilliant cut engagement ring has been crafted in 18 carat white gold. The ring features a brilliant cut diamond to the centre of the attractive frame. The tapering ring shoulders are a feature of this ring embellished with bright white brilliant cut diamonds to either side. The feature solitaire setting is supported underneath via a beautiful intertwining diamond embellished frame. This gorgeous ring has a classical elegance that will last the test of time. The diamond shoulders create a glistening array across the finger. This ring is sold with it's associated IGI certificate. This ring is available in a variety of ring sizes, please state ring size when ordering. If you have any questions regarding this brilliant cut engagement ring, please do not hesitate to get in contact with us. Crafted in 18 carat white gold. Set with impressive brilliant cut diamonds. Feature diamond content 0.23 carat. 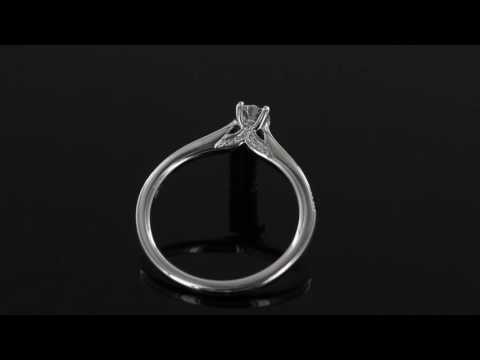 Surrounding diamond content 0.20 carat. This ring is available in a variety of ring size.